Bishop Festo Kivengere of Uganda (1919-1988) is one of the most widely known African evangelical leaders of the twentieth century. Central to his ministry, he preached the Christian doctrine of reconciliation into a Uganda where Christians lived under the horrors of Idi Amin's rule and its aftermath. 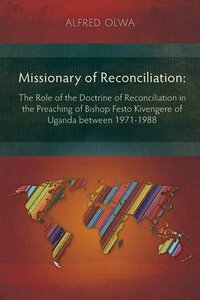 In this publication Dr. Alfred Olwa carefully examines 26 of Kvengere's sermons from a biblical and theological perspective to better understand his theme of reconciliation. Through this analysis we see Kivengere's deep understanding that the reconciling work of Jesus Christ is central to God's grand purpose for the world, from creation to new creation.